In 1950, the journal Mind published Alan Turing’s seminal paper, Computing Machinery and Intelligence, in which he proposed a behavioral definition of artificial intelligence. After all, if a machine can demonstrate intelligence, how can it not be said to possess intelligence? Turing’s test challenged computer scientists to create a thinking machine that, through conversation, could fool a person into believing that it, too, is human; Turing’s challenge continues to drive AI researchers today. With the proliferation of computers in modern life, the prospect of identifying thoughtful machinery takes on more than just theoretical or philosophical interest. 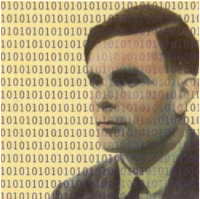 Back in Turing’s day, a thinking machine connected only to a “teleprinter” (as Turing envisioned) would have lived a lonely life, but today there are billions of people online with whom to converse, promising profound implications for society. For example, we increasingly find the machines who answer customer service calls to be more productive and thoughtful than human agents. Machines who demonstrate intelligence can communicate not only with people, but also with other machines designed to communicate with people – specifically, over 100 million web servers that invite human visitors to browse, learn, chat, transact, and share and with them. If a machine can demonstrate human intelligence in the eyes of a human judge, then no doubt it can win over these other machines on the internet, who are naturally less skilled at spotting other humans. Or are they? If, say, the human judge in a Turing test can distinguish the smartest machines from humans with 60% accuracy, how well could a machine do at judging them? I call this the Turing Judge Test, a corollary to Turing’s Test that marks a subsequent milestone in the development of AI. If a machine conversing with other parties can outperform the human judges in identifying the machines, that right there’s some mighty good thinking. With the benefits of shared learning and infinite storage, machines only get smarter over time, and so it seems inevitable that they will eventually pass the Turing Judge Test. On the other hand, as artificial judges get smarter, so do the artificial contestants. Even when machines do pass Turing tests with flying colors, how can they ever out-think other best-in-class machines? Or is there a way of distilling human intelligence into a single line of questioning that distinguishes silicon from gray matter? 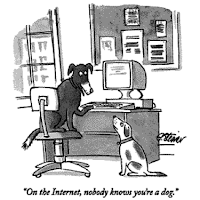 Such a distillation would have more than theoretical value – indeed, it’s arguably critical for the safety of any information society. This is not just a theory – machines are already smart enough that they account for most web traffic, successfully posing as human visitors to perpetuate fraud on the government and business web servers they talk to. 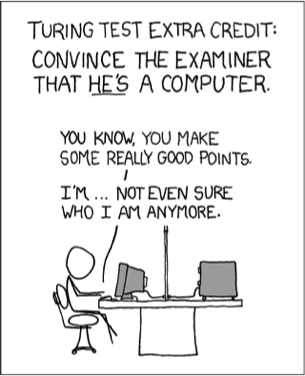 That’s why many sites use Completely Automated Public Turing tests to tell Computers and Humans Apart (CAPTCHAs). But CAPTCHAs create a nuisance for users and an outright obstacle for some disabled users; even worse, they can now be defeated in various ways – in other words CAPTCHA servers are machines who once passed the Turing Judge Test, but only until the machines they judge got smarter! As a result, malicious bots wreak havoc on the web, perpetuating data theft, account hijacking, application DDoS attacks, form spam, click fraud, and any other naughty action they can scale up through tireless automation. And that’s why I just invested in, and joined the board of, Distil Networks. Distil is run by a world class team of machine learning experts whose thinking machines can now distinguish other machines from people with over 99% accuracy. Staples, AOL, Dow Jones, StubHub and many others depend upon Distil’s cloud-based service to immediately eliminate entire classes of attack (and free up all the infrastructure they ran to serve the whims of robotic imposters). The Turing Judge Test has a winner!